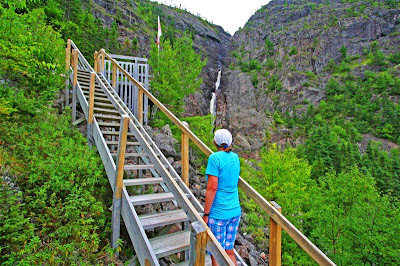 We recently had a chance to check out some of the fine hiking trails in the King’s Point area of Central Newfoundland. King’s Point is located on highway 391 (take the Springdale turnoff from the Trans Canada Highway). These trails have a lot of variety and an interested hiker could easily spend a couple of days walking the 4 trails that we explored. Let’s start with the longest trail-the Alexander Murray Trail which is located virtually in King’s Point. 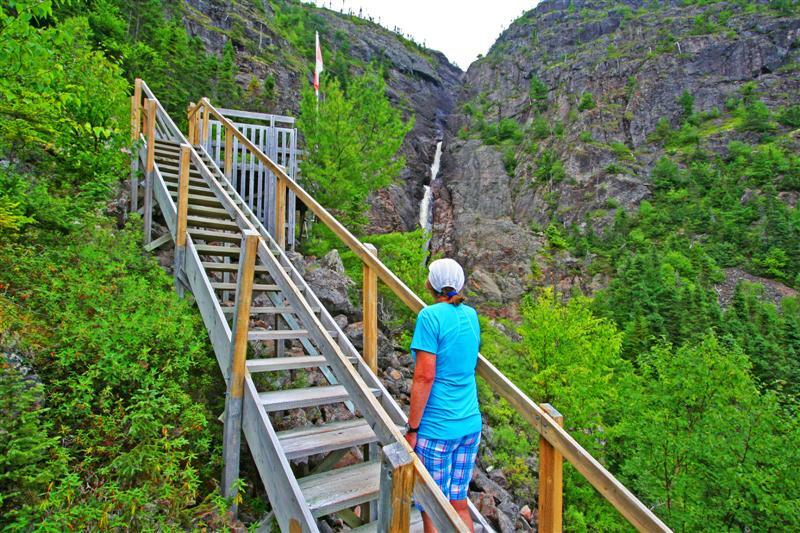 This trail is 8 km long and climbs to a summit of about 1000 feet. Overall there are 2200 stairs so you will get a good workout! The trail highlights include views of 3 waterfalls and the summit lookout platforms offer commanding views of the entire area. 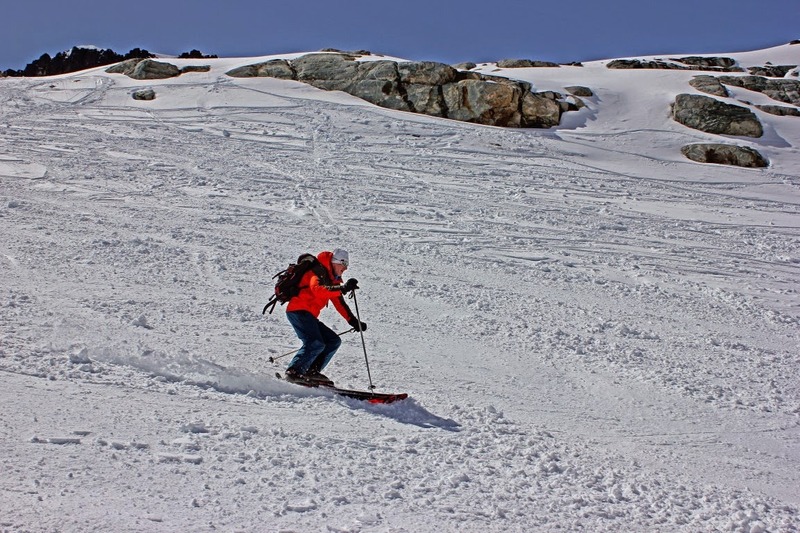 The trail is very well marked and you should allow a minimum of 3 hours to do the trip. 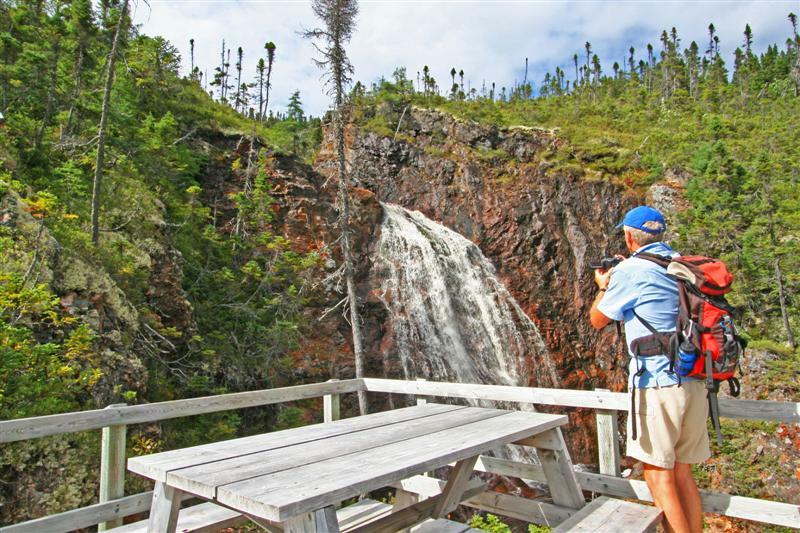 Nearby is the community of Rattling Brook and they have a short trail of about 600 meters (1 way) to a scenic waterfall. It too has many stairs but the shorter distance makes it doable by many hikers. There is a great place to have a picnic lunch across the road from the base of the trail. The next hikes are on highway 391 which extends to a number of small communities ending in Harry’s Harbour. 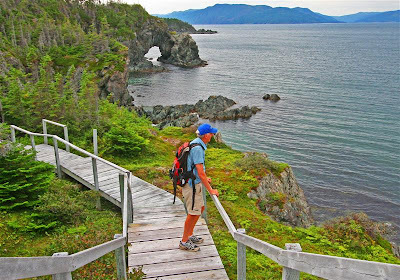 At Harry’s Harbour we recommend “Trail with a View” and we started from the beach at 49 42.167 N and 55 55.374 W. This trail has many side trails to various coves and lookouts but if you head straight to the end it is about 3.4 km - 1 way. There are no stairs on this trail but it does have some ups and downs. The trail winds through trees and open meadows with many scenic views of the rugged coastline. The meadows mark the early settlements of King’s Cove and Budgell’s Cove and Budgell’s Cove had an abundant crop of blueberries on our visit in late August, 2012. Allow about 1.5-2 hours to complete this walk – longer if you stop for lunch at one of the picnic tables enroute. 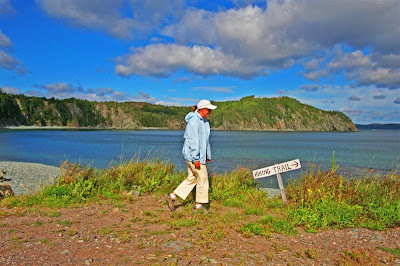 The final trail that we checked out was the Ocean View trail which is near the community of Jackson’s Cove (on the road to Harry’s Harbour). This trail is located at 49 41.422 N and 55 59.387 W and there is a very small parking lot just off the road. This trail winds through the forest before coming out to the coast where the highlights include a sea arch that has been carved out of the rock as well as fine shoreline views. There are also 3 lookout platforms which give good vistas of Green Bay. Again the trail is well marked and is about 2.2 km 1 way. Allow about 1.5 hours to do the return trip but there are picnic tables along the way so you could linger over lunch on a fine summer’s day. All of these trails are great for the average hiker. For anyone looking for a snack or meal, the By the Sea Café in King’s Point has good food and a great setting. We did the first 3 trails, but missed the Ocean View. Sounds like a good reason to return.